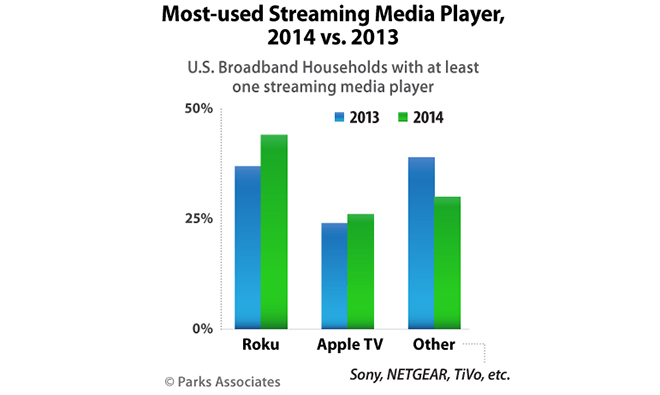 In its report, "The Evolving Market For Streaming Media Devices," market research firm Parks Associates says media streaming device sales are on the rise and will be in more than 25 percent of U.S. homes by 2015 as major tech companies like Apple, Google and Amazon fight for a spot in consumers' living rooms. Currently leading the pack is Roku, which according to the study accounted for 46 percent of all U.S. set-top streamer sales in 2013. The company's products are also touted as the "most used" devices in the nation, as 44 percent of households that own at least one streaming device use a Roku. The Apple TV came in a distant second with a 26 percent share of both sales and usage. As Amazon, the world's largest online retailer, emerges as a new competitor in this space, it could awaken the sleeping giant that is Apple." - Parks Associates research director Barbara Kraus The gap between the two top companies has widened since the start of 2013, when Roku usage was at 37 percent and Apple at 24 percent. Globally, however, Apple said it sold some 20 million units as of April 2014, compared to the 8 million units Roku sold by the end of 2013. "While approximately 50 percent of U.S. households have at least one Apple product, such as an iPhone or iPad, the company has not yet been able to leverage this success for its Apple TV offering," said Barbara Kraus, research director at Parks Associates. "Apple has not committed support and promotion to its Apple TV product line in the U.S., and its sales reflect this fact. As Amazon, the world's largest online retailer, emerges as a new competitor in this space, it could awaken the sleeping giant that is Apple." The firm also noted that stick-type streamers encroached on Roku, Apple TV, Amazon Fire TV and other "boxes" during 2013. For example, Google's Chromecast reportedly sold just as many units in six months as Roku moved in all of 2013. Usage of the Chromecast has been in decline, however, suggesting popularity of the stick format is ebbing. Despite flagging interest in Chromecast, Google isn't giving up on the living room and recently announced Android TV, its third foray into the streaming market. As with the Android mobile OS, Google will focus on platform development, leaving hardware production up to OEMs. Companies like Sony, Sharp and Philips have already signed on to make Android TV-powered television sets that will debut in 2015. 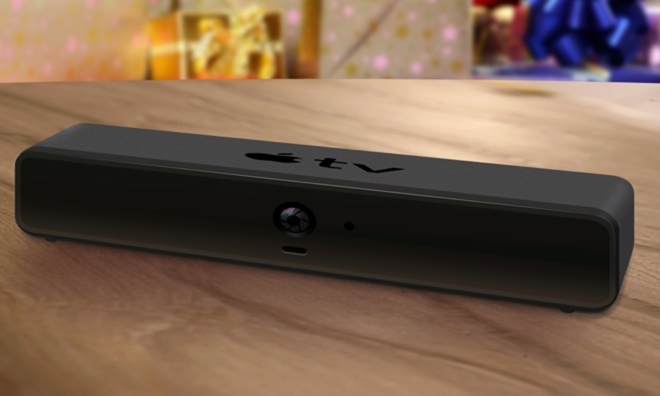 Camera-equipped Apple TV concept via Brightcove. Apple is also rumored to be working on a new Apple TV product that is expected to debut by the end of the year. Not much is known about the device, though insiders believe the company will include a motion control interface akin to Microsoft's Kinect. Some have speculated that Apple's upcoming iOS 8 HomeKit framework for supporting smart home products could see integration with a new Apple TV. Serving as a centralized control hub for lights, thermostats and other connected appliances, Apple's set-top streamer would expand its role from content consumption device to necessary cog in a smart home's ecosystem.